A rewarding and enjoyable hobby and potentially profitable business venture, beekeeping provides many benefits. Not only do many beekeepers find activities enjoyable, but they continue to develop new and interesting ways of taking advantage of their readily available honey supply. From fresh honey used in homemade recipes to the inclusion of honey in handmade soaps, shampoos, lotions and candles, honey bees can provide you with plenty of products for your own use or as inventory for a small business. Everyone is familiar with the expression "busy as a bee" and anyone who has paid attention to honey bees knows the phrase is accurate. Bees work diligently to bring nectar to the hive, so hard in fact that they wear out their little wings in just 35 days. Honey is actually a food source for bees, stored in the hive's "pantry" in anticipation of days when outside food sources are scarce. In times of floral abundance, bees are able to collect plenty of nectar, and their excess honey stores are not required to sustain the hive. This excess honey can be collected by the beekeeper for personal or business use. When outside nectar sources are scarce, bees will require more honey to survive, limiting the amount beekeepers are able to harvest. If beekeepers are interested in collecting consistently bigger quantities of honey they will need to do one of two things. Either increase the size of and number of colonies or provide a bee food supplement during seasonal changes or difficult periods in the local climate or ecology. Beekeepers can profit from the sales of two kinds of honey. Liquid honey easily extracted from the hive is the first. By utilizing a centrifuge, they can remove honey from combs with little physical effort. However, selling pieces of the comb is also a profitable means of earning income from beekeeping. Many individuals prefer this kind of honey's natural flavor in spite of its less convenient form. Most people are unaware that honey actually comes in a variety of colors and flavors. The flavor of honey is significantly influenced by the nectar bees collect. The soil composition, varieties of floral plans, and the general weather conditions in your geographical region will all impact the flavor of the honey produced by the hive. The color of the honey is also affected by the plants honey bees obtain nectar from. For instance, alfalfa nectar produces honey ranging from clear to white, while honey resulting from the bee's harvesting nectar from buckwheat tends to be significantly darker. Honey can be found in clear, white, gold, brown, red and even greenish hues. The quality of the honey combs constructed by bees can also affect both the color and flavor of the honey. If beekeepers are processing and packaging honey for profit, it is important to research, learn and follow all state and federal regulations associated with food. Beekeeping for profit is a business like any other and local governmental guidelines can vary so you will need to do your homework and ensure that you are meeting all of the appropriate general business and food specific laws and regulations. Your business will also benefit from some formulated marketing strategies. Targeting sales, advertising products, and developing venues in which to display, promote and sell your bee products are just a few things to consider. While you may enjoy your beekeeping as a personal hobby, if you want to see a profit you'll need to think like a business person. Make careful decisions, invest wisely in various opportunities, and find ways to establish your own market niche. Lance Murdock is a beekeeping enthusiast and author. He lives in Los Angeles and spends his time teaching others how to setup a healthy, sustainable beekeeping hive in your backyard. For more information on honey bees beekeeping [simplebeekeepingguide.com URL not valid]. This How-to-do-it approach to building bee equipment provides a clear plan to make your own bee equipment. 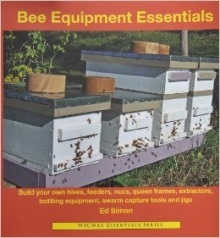 Even if you never build bee equipment, this book will help you understand how to assemble and use many useful beekeeping tools. Build your own hive stands, bottom boards, entrance reducers, hive bodies, inner covers, telescoping covers and feeders. Build a variety of nucleus hives. Or build your own top bar hive. Build frames and bars for queen production, and make a Cloake Board. Make your own honey extractor and tools to help you process honey. Capture swarms with devices you build from inexpensive equipment. Build these items from materials you "recycle" in a dumpster dive; enjoy building things you never dreamed you needed, like jigs, that hold equipment together during assembly. Build a solar wax extractor and harvest the wax found in wax scraps and old combs.